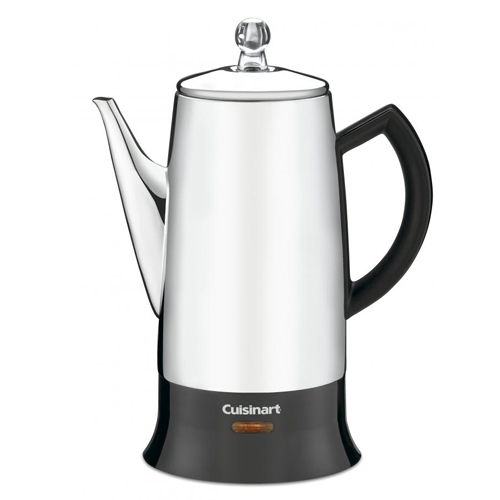 The Cuisinart PRC-12 classic stainless percolator brews 4 to 12 cups of coffee offering an elegant way to serve coffee to dinner guests. The unit circulates piping hot water through coffee grounds and pulses up into the glass knob on top to create the familiar percolating sound that coffee lovers love. The PRC-12 has a ready-to-serve light that indicates when coffee is ready to enjoy, while the detachable cord provides the ability to serve fresh perked coffee right at the table without any hassle. Other useful features include a precision drip-free spout, an easy-grip knob on the unit's lid, and a stay-cool bottom. The 12-Cup Stainless Steel Percolator has many exciting features for users of all types. You can extend the lifetime of your 12-Cup Stainless Steel Percolator with the purchase of a FactoryOutletStore Factory Protection Plan. See the 12-Cup Stainless Steel Percolator gallery images above for more product views. The 12-Cup Stainless Steel Percolator is sold as a Brand New Unopened Item.